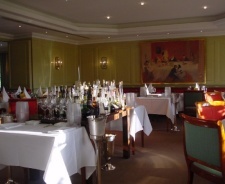 Landhaus Scherrer is Hamburg�s premier gourmet restaurant for German cuisine. Guests can indulge themselves at the hotel's gourmet restaurant and extensive adjoining winery. The chef Heinz Otto serves a modern fusion of German and French cuisine with vegetarian and children's menus available; the menu changes weekly according to seasonal availability and may include such delicacies as Saddle of venison wrapped up in bacon or Jacob shells with chanterelles and sauce "Amoricaine".